Happy Monday! Sorry for posting a little later than normal. I am running a little behind and although it will be short and sweet, I do have a great Bourbon to talk to you about today. 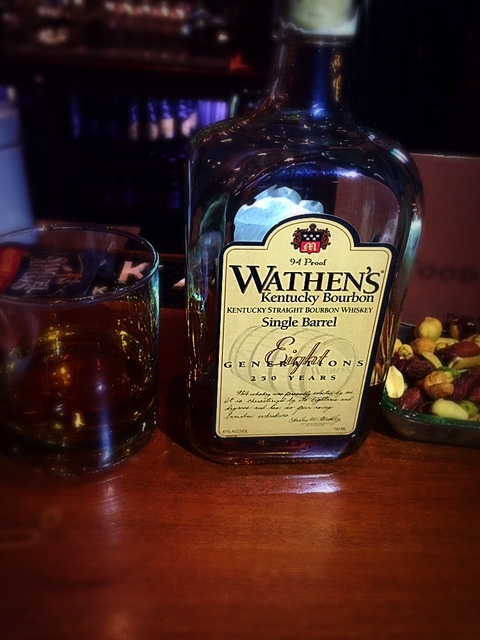 Before this year I had not tasted nor had I ever heard of Wathen’s Kentucky bourbon until Frank from The Last Hurrah introduced me to it. The Medley family produces Wathen’s and they have been producing Wathen’s for eight generations. Charles and Sam Medley currently oversee the distilling of the bourbon. The bourbon itself is composed of a corn, rye and malted barley mash. The Wathen’s family recipe has also gone unchanged since the bourbon started distilling. I very much enjoyed this bourbon. There is a light and smoothness to it that I think any bourbon and non-bourbon drinkers would enjoy alike. It’s tasty and will not hurt your wallet too much as its priced around $40. This bourbon is creamy, delicious and it’s a quality product you can’t beat the price on. This is a bottle I would definitely add to my collection and would definitely recommend to anyone.